I have heard of the buzz earlier about the launching of our very own Malaysian ads programme. 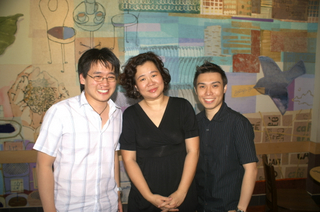 I have the opportunity to meet up with Timothy during the recent Penang Bloggers Meeting. The white shirt is Timothy and the black shirt is Bryan of SapiensBryan.com, the webhost of most of my sites. I shared with him my experiences with other ads programme and strongly support the company nuffnang.com.my because it is time, we Malaysians, move forward aggressively in online advertising. From my observations during the last Penang Bloggers Meeting, the new generation of bloggers are going to multiply by several hundred folds. So, it is high time that we see our local companies advertisements grace those thousands and millions of blogs that will sprout like mushrooms after the rain. NuffNang.com.my is in beta stage. Beta means something like work-in-progress/testing. However, in support of this Malaysian grown company, I have submitted my blogs today. You should too. I tried the 160×600 ad format and the nice thing is the format did not take up all 600 pixel high but only appear as the small square on the sidebar until an advertiser takes up the slot. So go on, sign up. If you need help with the promotion of your blog, remember to read my tips here. I have shared many articles on how to promote your blog to advertisers. Don’t over look that important point. And folks, start making your blog sells. How? Read Make$ Money$ and I will gladly share with you how to earn some money from blogging. Congrats to Timothy and his team at NuffNang.com.my. I wish you all success! Cheers!